What can conservatives do for cities? Imagine an urban policy agenda defined by simplifying business regulations and promoting entrepreneurship as the key to prosperity. Add to that an attack on overly restrictive zoning laws that hold back housing construction, inflate real estate prices, and keep high-opportunity cities closed to low-income people looking to improve their lives. Round out the party platform by promoting regionalism and metropolitan-level decision-making. According to National Affairs, this is what American conservatives have to offer their increasingly urban-centric countrymen. In an article published in the magazine’s most recent issue, Michael Hendrix of the U.S. Chamber of Commerce Foundation and National Affairs editor Andrew Evans lay out the case that the political dominance of liberals and leftists in nearly every big city in the country is a bad thing, and not just for conservatives. The first part of their premise, at least, is undeniably correct. Large American cities are overwhelmingly left-of-center: Hendrix and Evans point out that of the top ten cities by population, only one has a Republican mayor, and he only got there because the previous Democratic incumbent had to resign in a sexual harassment scandal. Nor is National Affairs the first to notice: cities’ one-sided voting patterns are a regular subject of angst, both by Republicans who loathe surrendering the nation’s major economic and cultural hubs and Democrats who wonder if they’re missing something. The problem seems to have two parts. Politically, modern American conservatism is built around a particular brand of social conservatism popular among white evangelicals, and small-government libertarianism. The first seems in direct opposition to cities’ role as places of social experimentation and cultural cosmopolitanism. As for the second, to paraphrase Ed Glaeser, just as there are no atheists in foxholes, there are no libertarians in cities. Living in close quarters with hundreds of thousands or millions of other humans makes “rugged individualism” sound like a kind of joke: from noise complaints to traffic to “unsavory” businesses, it’s hard to find an urban resident who doesn’t favor some suite of strong government regulations. So many externalities. Credit: Matt Baran, Flickr. But it also seems to be the case that, speaking broadly, conservatives don’t like cities, and don’t want to live in them. There are some exceptions, of course. The relatively young Smart Growth for Conservatives blog has been making a vigorous right-of-center case for pro-urban policy, and the traditionalists at The American Conservative have long appreciated the communitarian aspects of city living. 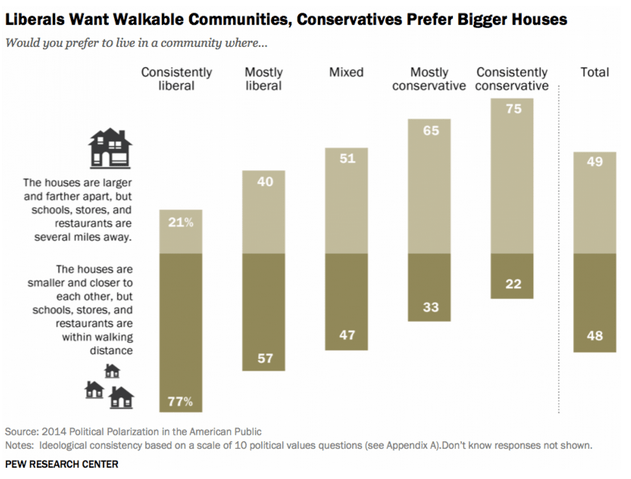 And yet, when explicitly asked to weigh the tradeoffs between more space and more walkable amenities, the ideological split is massive: a Pew survey found that “consistent liberals” will choose the dense, walkable neighborhood three out of four times, while “consistent conservatives” are equally likely to choose the more classically “suburban” neighborhood. And as Slate’s Will Oremus pointed out a few years ago, even where conservatives live in large cities, they tend to be among the country’s least dense and walkable. Hendrix and Evans seem to think they’ve found a way around these issues by appealing to the self-interests of otherwise liberal city dwellers: more prosperity, more opportunity, better governance. The problem is that Hendrix and Evans have simply repackaged what are already planks in the liberal urban platform. While it’s true that getting a permit from a big city bureaucracy can be a terror, major Democratic mayors like Rahm Emanuel and Ed Lee have made streamlining regulations and creating a more business-friendly environment a top priority. (And in the process, they’ve frequently received a good deal of blowback from their urban constituents, a fact which doesn’t bode well for National Affairs’ campaign strategy.) I suppose they could argue that “real” conservatives would do a better job, but that’s a debate over administrative competence, not ideology. The last two points of their “urban agenda for the right” are even more dubious: not only have they already been adopted by portions of the urban left, they are vociferously opposed by conservatives. President Obama’s new HUD rules specifically take aim at the kind of exclusionary zoning laws that Hendrix and Evans say are keeping cities “closed” – and, far from being welcomed as a move towards less government intervention in the economy, has been blasted as a disaster comparable only to the hated Affordable Care Act. Where Obama’s HUD has previously attempted to loosen zoning controls in Westchester County, just outside New York City, the Republican country executive protested vigorously, vilifying the order and energetically defending low-density zoning regulations. As for regionalism, one of the most prominent cases in the country is the Twin Cities area in Minnesota, where the “Metropolitan Council” holds a much greater than normal amount of power over land use decisions. One of the greatest proponents of its regional influence is Myron Orfield, who spent several years as a state legislator in the Democratic-Farmer-Labor Party. On the flip side, Minnesota Republicans have launched a campaign to weaken the Metropolitan Council and devolve power to municipalities – exactly the opposite of Hendrix and Evans’ proposals. To be clear, the vast majority of American cities, regardless of ideology, fail miserably on all of these counts. Anyone who’s been reading the news out of San Francisco knows that liberals are perfectly capable of viciously opposing open zoning laws. But where some political leadership has staked out a position in favor of the changes National Affairs wants – particularly on the issues of exclusionary zoning and regional planning – it is almost always left of center. Meanwhile, the Obama Administration’s new HUD rules appear to have convinced the conservative establishment that setting extreme land use regulations is an inviolable right of local government. 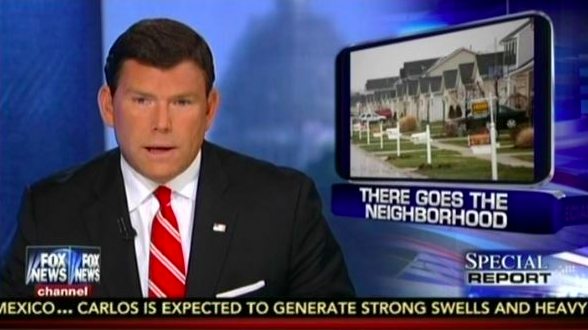 Fox’s coverage has been less than positive. Does conservatism have nothing to offer cities, then? I wouldn’t go that far. More than liberalism, whose philosophical roots are based on the primacy of individual rights, certain strands of philosophical conservatism understand that complex webs of relationships, rather than simply individuals, are the buildings blocks of society. When we use the language of community, of ties to people, places, and institutions that should be valued not because they promote any tangible good but because they are part of the traditions that give our lives meaning, we are arguably borrowing from a conservative vocabulary. We need that vocabulary to fully understand what cities offer us, and what we lose when communities are displaced, whether by rising home prices, low quality of life, urban renewal, or some other force. Conservatism also offers a skepticism of ambitious, top-down planning that fits very well into a certain kind of urbanism. Jane Jacobs’ The Death and Life of Great American Cities is all about how successful urban spaces depend on a respect for gradualism and the kind of organic changes that can’t be planned. The critique of Robert Moses’ “meat ax,” of his plans to create a blank slate on which to build his own version of utopia, relies more than a little bit on an Edmund Burke-style understanding of the problem with sweeping away old institutions that may appear irrational but are in fact of tremendous value. Unfortunately, none of that appears in the National Affairs piece. Instead, we get a series of policies that have already either been adopted by liberals or to which conservatives have proven themselves openly hostile. When the next conservatives-in-cities essay appears – as it certainly will – there will hopefully be a bit more on offer.